Dr. Hardtman speaks to the breakfast panel attendees. Photo credit: Elly Arnoff. Dr. Romanzi opened by describing the many sequalae—both short-term and long-term effects—related to P/OL including maternal death, stillbirth, fistula, sepsis, infertility, chronic pain and mental health issues, as well as cerebral palsy, neurological damage and paralysis among infants. 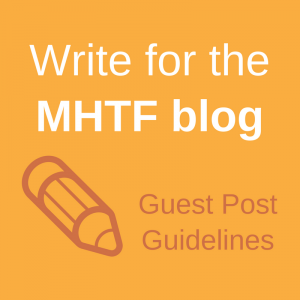 Dr. Tripathi added that the World Health Organization (WHO) has called obstructed labor “the most disabling of all maternal conditions,” contributing to 2.8% of global maternal mortality and complicating approximately 3–6% of deliveries. Despite the gravity of P/OL, there is inadequate guidance available to skilled birth attendants (SBAs). The literature on P/OL provides no clear definition of the condition, and the terminology associated with it varies, leading to delays in identification, referral and management. While the fistula literature contains more guidance on the postpartum period, there are still inconsistencies, such as the recommended duration of time for urinary catheterization after P/OL. Additionally, attention to P/OL sequelae is limited to identifying and treating obstetric fistula, with no training programs for evaluating and managing other conditions related to P/OL. To understand the range of postpartum practices that SBAs employ, FC+ launched an online survey targeting SBAs from low- and middle-income countries on intrapartum and postpartum practices and bladder care management. Dr. Tripathi presented preliminary findings from the pilot phase, highlighting the considerable variation in responses regarding how SBAs define P/OL, the criteria they use to assess it and the amount of time they catheterize after P/OL. Dr. Tripathi concluded by encouraging attendees to take the survey and to share it widely with their SBA networks. Intrapartum: Catheterization during P/OL keeps the bladder empty, so the passage of the baby is not blocked during labor. Immediately following P/OL: Second, short- to medium-term duration of postpartum catheterization may prevent fistulae after P/OL, though the evidence base for its efficacy is minimal. Postpartum: A growing body of evidence suggests that catheterization of a bladder with a fresh fistula may close fistulae spontaneously, without surgical intervention. 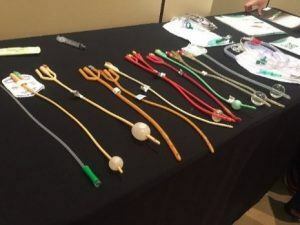 Foley catheters on display at panel event. Photo credit: Elly Arnoff. Dr. Hardtman followed by highlighting how midwifery-led prevention and conservative management of obstetric fistula through catheterization has a profound impact on women who experience P/OL. While these resources provide SBAs with concrete guidance, the theory-to-practice gap in implementing these practices remains an issue. Dr. Esienumoh discussed midwifery-led prevention and conservative management of obstetric fistula efforts in Nigeria. The Nursing and Midwifery Council of Nigeria (NMCN) regulates midwifery practice in Nigeria and participates in the formulation of all Federal Ministry of Health (FMOH) guidelines, including the recent catheterization guidelines. NMCN has been working with the FMOH to develop and disseminate catheterization guidelines, integrating a pre-service package into existing curricula and updating other training curricula for nurses and midwives. Dr. Esienumoh emphasized the importance of including nurses and midwives in the development and implementation of these guidelines. Dr. Smith discussed maternal and newborn sepsis as a consequence of P/OL and called for more comprehensive approaches to managing P/OL and its related sequelae. Despite progress in reducing maternal mortality over the last two decades through a focus on postpartum hemorrhage and pre-eclampsia, there are still substantial gaps in how SBAs address other complex cases. 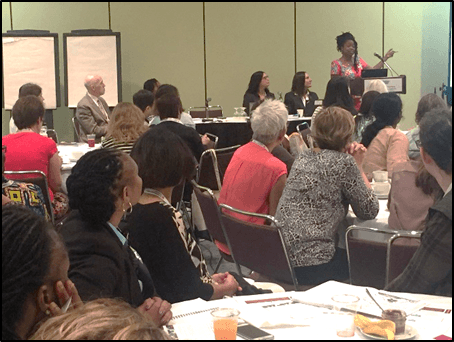 Dr. Smith stated that P/OL is just as dangerous as other obstetric emergencies such as eclampsia, hemorrhage and fetal distress, urging the maternal health community to prioritize P/OL management and develop innovative approaches. Following the presentations, attendees generated a lively and thoughtful discussion. One attendee noted that partographs are often completed after delivery, distorting their intended purpose in labor monitoring and identifying P/OL. Panelists discussed the need for integrated training on the partograph as part of the continuum of care. Prior work by EngenderHealth and its partners on the partograph also addresses these challenges. Attendees discussed the steps involved in building nursing and midwifery capacity to implement guidelines. Dr. Smith pointed out that lessons can be learned from other interventions and services that midwives have integrated into their practice and that new service provision approaches are opportunities to collect data and document the efficacy of these changes. Expanding midwives’ and nurses’ scope of practice to address obstetric fistula in labor and delivery units through catheterization will reduce the need for surgical treatment of fistula. Learn more about the Fistula Care Plus project. 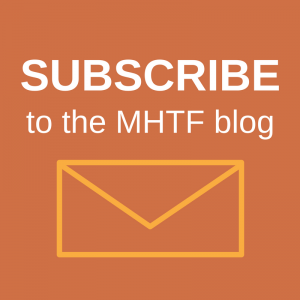 Read the Maternal Health Task Force’s mini-series about obstetric fistula. Access resources related to postnatal care.